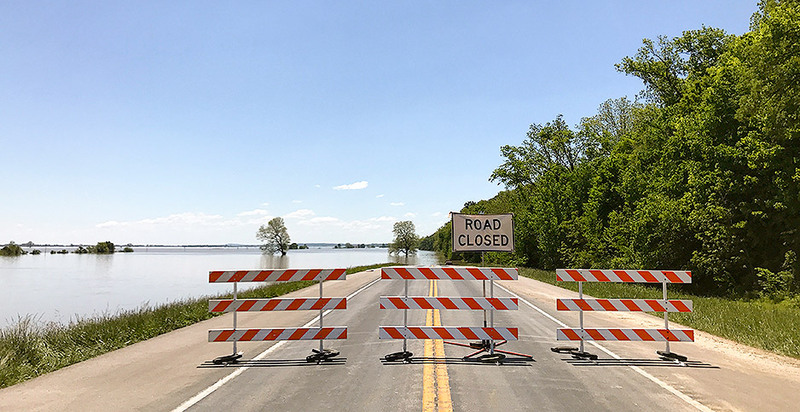 Floodwaters close a road along the Mississippi River south of St. Genevieve, Mo. Photo by Erika Bolstad. "This has happened twice, gosh, in what, the last 15, 16 months?" Schaaf said. "The more walls that are going up, and the man-made condensing of the water, the channelization, I'm not saying it's not climate change, but I think this is the biggest reason why we're seeing it here. "I think it was an unforeseen thing that they knew might happen," added Schaaf. "But I don't think they realized to the extent of what it is." "The scientific consensus I think is pretty clear here," said David Stokes, executive director of the Great Rivers Habitat Alliance, which addresses issues affecting wetlands and promotes sensible use of floodplains in the confluence region of the Mississippi, Missouri and Illinois rivers. "The increased flooding we're seeing in many parts of the Midwest, it's a man-made phenomenon," he said. "We're building in the floodplain, we're putting concrete and asphalt shopping centers where Mother Nature wanted to go, and we're over-channelizing the rivers top to bottom at the same time." Climate change is "exacerbating poor choices that we've made on development," he added. "If this pattern continues, we're in for some expensive repeats going into the century," he said. "How do we make it so that the way that we mitigate, we can still have the economic possibility and prospects that the Mississippi River provides? How do we learn to live with the river, not make the river live with us?" The high-water marks in Cape Girardeau, Mo., don't yet reflect the all-time river high of 48.86 feet set in January 2016. Recent rains and flooding put the river at 45.99 feet. Photo by Erika Bolstad. Kevin Trenberth, an atmospheric scientist at the National Center for Atmospheric Research in Colorado, gets asked the question so often about the connection between big rain events and climate change that he had this response via email: "Here we go again." 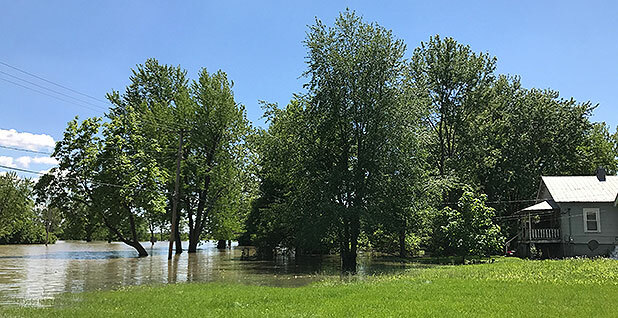 Trenberth described the recent weather throughout the Midwest as a "typical springtime situation bolstered by climate change." Sea surface temperatures are higher because of climate change, he said, adding about 5 to 10 percent to precipitation levels. He attributes another 10 percent of extra moisture to weak El Niño conditions in the Pacific. "Believe me, I am concerned about what humans are doing," he said. "That is not our hugest problem, and that does not explain this. This river constriction is the No. 1 cause. Heavier precipitation in four days, of course that's going to make these events more frequent. But the main flooding problem is that we don't get along properly with our rivers." "Flood damage, human beings are absolutely responsible," Criss said. "It does not take a rocket scientist to look at a map and see where floodplains are. We know where these low-lying areas are. And yet we seem to insist on building levees and thinking that developing in these low-lying areas is OK. And it's not OK."
Climate change means communities must re-evaluate hazards, exposure and risk, said Diffenbaugh. All of them contribute, he said, and an exclusive focus on any one dimension, whether it's levees that are too high or the effects of global warming, "doesn't give people accurate answers." "It's clear just from the disaster losses in the U.S. on an annual basis that we're not adapted to the climate we have now," he said. "Americans will be more safe and more secure if the management of those risks also acknowledges that the climate is changing. We have a lot of opportunity to catch up with the climate change that's already happening, and prepare for the climate of the future." Floodwaters from the Mississippi River threaten a home in the Red Star neighborhood of Cape Girardeau, Mo. Photo by Erika Bolstad. 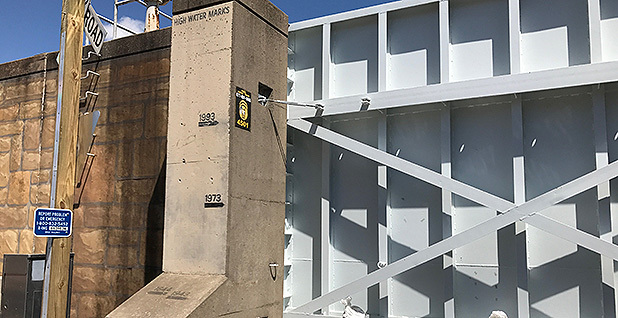 "There not an expense project, they're an investment," Rediger said of the flood wall, while giving a reporter a tour of the city and its flood-defense infrastructure. "They're an investment because they mitigate future damage, and just have paid for themselves so many times. "We're very fortunate to have gotten this," he said. "Very fortunate." "The buyouts in that area have saved a lot of grief for a lot of people and a lot of damage," he said. "I'm tired of the river coming and visiting," Weaks said.